In my previous post, I was so enamored with a group’s creation of the average velocity step graph that I neglected to check that group’s math. So I graphed their data again, this time using steps that start at t=0 (in black below). This meant the steps overlapped and it was hard for me to see the “best fit line” in this case (also in black) though this time there is no intercept. In red, I calculated and graphed the interval average velocity that I thought they had done originally. Yikes! The average velocity is all over the place. Small timing errors seem to have a much bigger effect for the interval velocities. I still like the activity, but I don’t want to make it more complicated than necessary, especially with errors in the interval velocities. Now what should I do next year? Have everyone do it their own way first and then repeat data collection having everyone use time as independent variable? 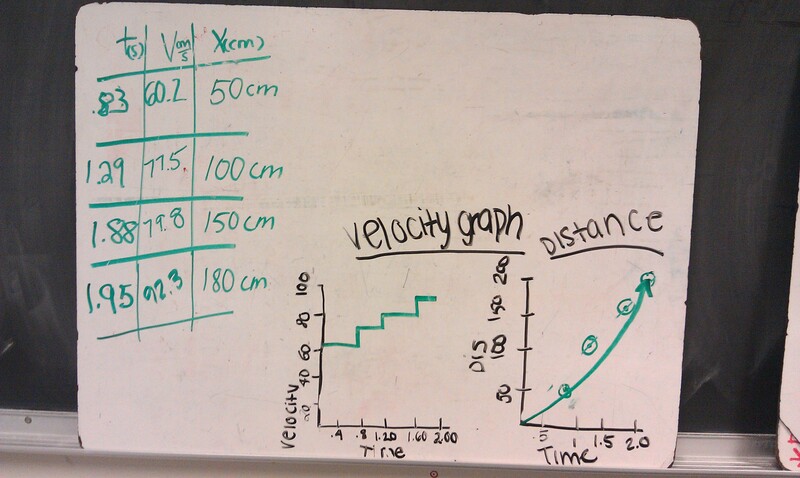 Skip the velocity graphing altogether (my original intention, until I saw the students’ step graph)? I say go constant time intervals. I love your blog it is veryy interesting! Ouch! I was wondering how you got such awesome data from a battery. The golf teed wheel only accelerates 1m/s/s in my class and the delta v is MESSY. I still like the data table with greyed out delta columns. I use it in the constant velocity lab first to get the idea of delta values. Kinda hand wavy when it comes to graphing, but all our subsequent graphs use whole number midpoint times. Maybe the key is to get such a low acceleration that you can set delta t to 2 seconds? Midpoint time would then be an integer. Love the blog, Frank. Keep it up. Tell mark schooner I said hi! When I have the kids do accelerated motion, I just have them plot x vs t, then we whiteboard, and come to a consensus that x vs t^2 is linear. Then I have them calculate data points for what the perfect parabola would have been for their data using their best fit to x vs t^2, using 1 second intervals. From that graph, the slope of each segment gives the correct avg. velocity, which they can see from their constant. V work. Plotting those avg. velocities vs. mid-time of each interval gives the perfect v-t graph, whose slope is acceleration.